Karen Burns is an Assurance Partner with Sensiba San Filippo LLP, a leading regional CPA and business advisory firm, and Co-Founder of the Association of Manufacturers Bay Area (AMBayArea), a trade group dedicated to addressing the daily challenges manufacturers face. Karen has nearly thirty years of experience providing financial and business consulting services to companies in a variety of industries, with a particular passion for the manufacturing and distribution sector. She has great depth of experience working with rapidly growing manufacturing companies, from start-ups to multigenerational family businesses, helping them to identify opportunities, challenges, and trends. Karen identifies and works with clients on financial and tax opportunities that are consistently under-leveraged such as hiring credits, research and development credits, derivative use and international accounting solutions. Such information is essential for companies to enhance growth, manage risk and supplement their bottom line. Karen’s work, commitment and passion led her to establish the Association of Manufactures Bay Area, which provides a platform for networking, education, and sharing industry specific thought leadership and best practices. In addition to building strategic alliances and affiliations, AMBayArea is committed to helping manufacturers grow their talent pipeline and connect with a skilled workforce. AMBayArea promotes economic development and innovation among manufacturers – regardless of size and focus. Karen is sought after nationally for her expertise in Manufacturing, and is frequently leveraged by media for content and perspective on industry trends and best practices. Most recently she was interviewed by such media sources as Marketwatch, Bloomberg BusinessWeek, San Francisco Business Times, San Jose Mercury News and Manufacturing Digital. Karen was also awarded the YWCA TWIN Award in 2003 and 2011, named one of the “Women to Watch” by CalCPA in 2010 and recognized as one of the “Most Influential Women of the Bay Area” by the San Francisco Business Times in 2013, 2014 and 2015. 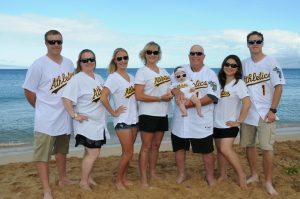 This die-hard A’s fan lives in Livermore with her best friend and husband of over 20 years. She has a daughter (Kelly), two sons (Brett and Kyle), and two daughters-in-law (Kelly & Kelly). Yes, that’s right, three Kellys! When she is not in the office, she enjoys a great bocce match, challenging friends on Fitbit, or scrapbooking the afternoon away. Karen has also made a personal commitment to end breast cancer by walking hundreds of miles and raising thousands of dollars for the cause. Her largest commitment has been the 39-mile, 2-Day Avon Walk, which she has participated in for fourteen straight years.